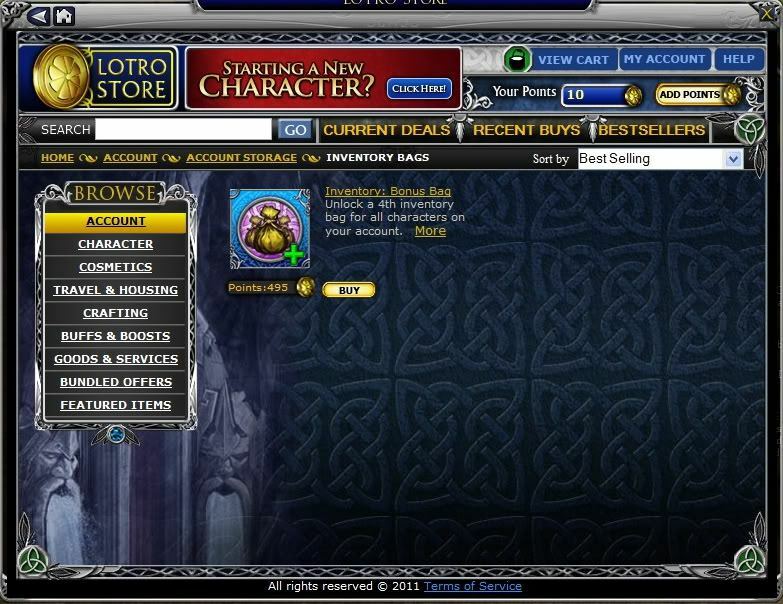 The LotRO Experiment Part 3: I’m rich! I’m rich! … Ok, I am not. By the end of the last session, Basilio had a bunch of opened quests but only a few of them were actually solved. There wasn't any Turbine Points gained, nor much progress done either in level either. So this time I wanted to try to rectify that a bit. Looking at my quest log, the lowest level quest, it seems there were some shrews opening burrows east of Michel Delving. Ruby Primstone wanted me to close some of them for her. Off I went to do so! 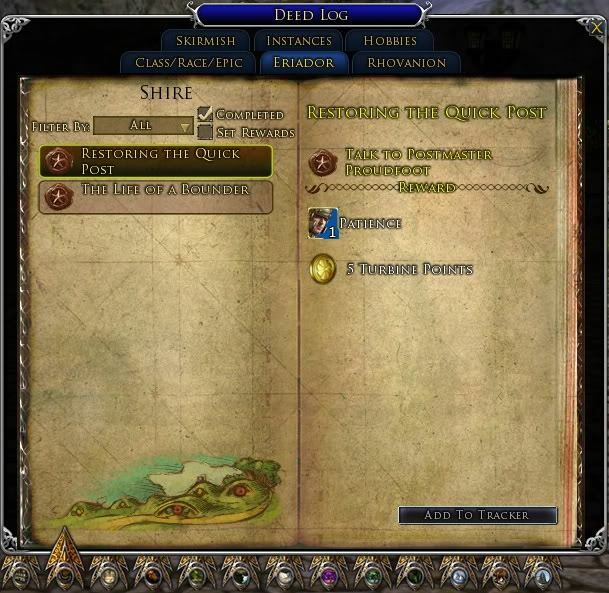 Now, the reason I am pointing out this quest is because of another neat thing about LotRO. See, each borrow has one or two shrews near it. Usually in MMORPGs, wild animals are either completely passive, only fighting if you attack them first, or they are aggressive and will attack anything with two legs that enters their line of sight. 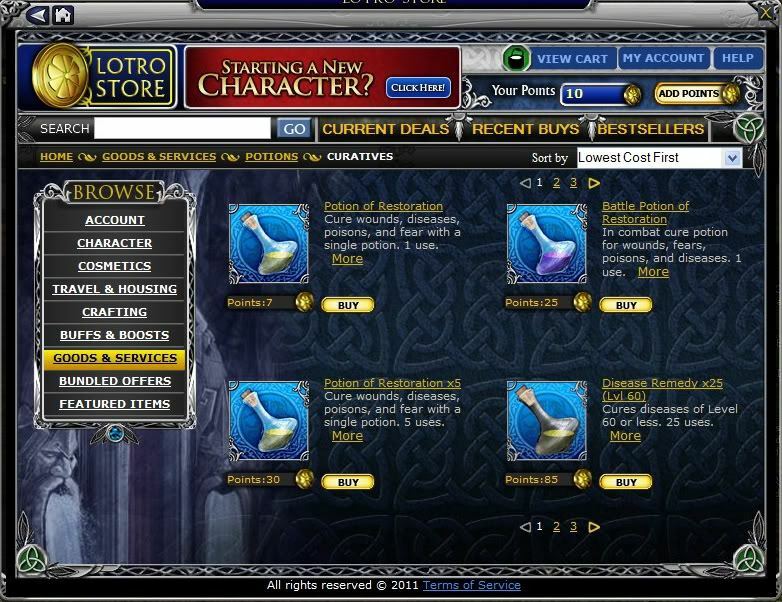 In LotRO however there is also another category. See, a lot of the wild life in this game would behave as you expected them too in real life. If you get close enough, they will threaten to attack. If you move away, they go back to their business. But if you just stay there staring at them like a fool then they will attack you. That was the case with these shrews. I also noticed the same behavior with some boars and badgers in the Shire. Anyway, burrows were closed, Ruby Primstone was happy and there was one less quest on my log. Still many more to go! A drink recipe was found, the money for the Town Hole recovered and a lost cow found (dead, by the way). With those I completed the Life of a Bounder deed, earning me the Compassion virtue (more about it in a bit) and 10 Turbine Points. Which also unlocked a new deed, The Life of a Bounder (Advanced). It may not look like much now but I am sure something will happen soon enough for me to wish I had that potion! Now for the sake of comparison, let's look at the cost of some stuff with more long term value. My explanation about the Virtue system, just like pretty much everything so far, will be based on my understanding from playing the game. If there is any misinformation then I will correct it in a later post. 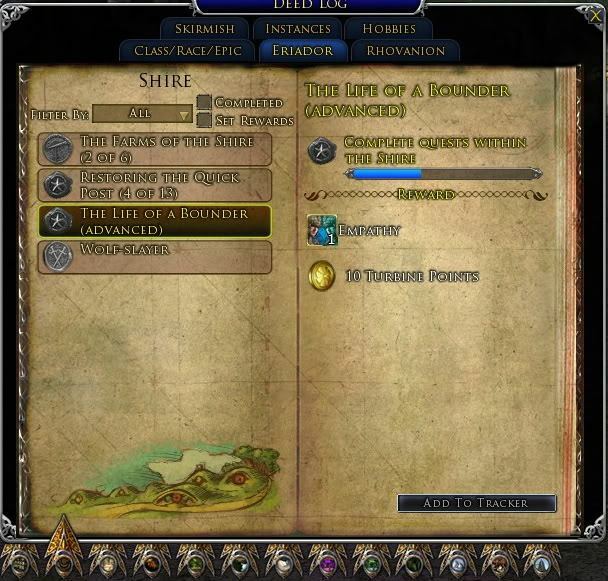 LotRO has a system of passive buffs, called Traits, that you can earn and then equip. Why would you have to equip them if they are passive? Well, that is because there is a lot of them. And which ones you can have equipped at a time is limited, with each category having a different number of trait slots to equip. To equip any trait you go to a bard NPC and pay some copper to do it. Traits are divided in four categories: Virtues, Race, Class and Legendary traits. 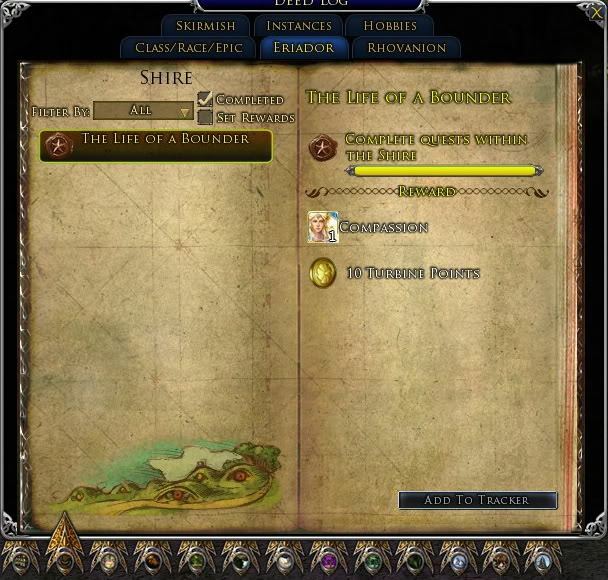 Virtues you earn by completing region deeds, i.e., doing all the quests in a region gives you a deed, finding points of interest in a region gives another deed, slaying certain mobs in a region gives yet another deed, etc. They have the more generic effects, like more defense, better regen, etc. Class traits you earn by earning class deeds. Those deeds are then earned by using certain spells/special attacks over and over in a fight. Usually the ones you would just use anyway. Class traits are also like the usual Talent trees in other games, like World of Warcraft, enhancing certain abilities of your class. Legendary traits seem to be similar to class traits except the bonus is a lot bigger. The only trait I have now is the Compassion virtue. So I went to the local bard NPC, paid 6 copper for it and got it equipped. If you are curious of what that virtue does, it gives me +200 Ranged Defense Rating, +50.6 non-Combat Power Regen and +200 Tactical Defence Rating. If you are wondering if that is any good or not…. Well, I don’t know either! But I got it already so might as well use it. 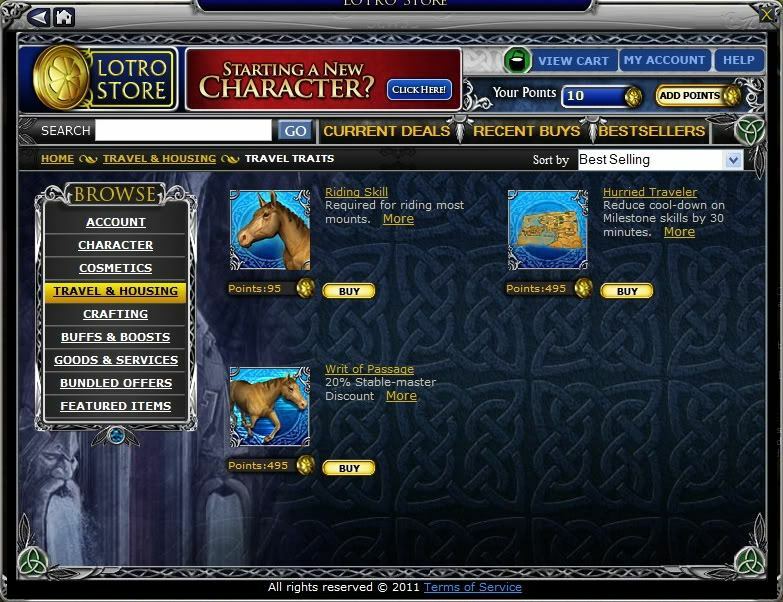 My LotRO play time was running short for the day. So I decided to finish the mail bag delivery quest line and get rid of it. To be honest, that took way longer than I was planning to complete it. At least that is out of the way now. It also got me another 5 Turbine Points, the Patience virtue (how appropriate!) and got me to level 10, almost level 11. Trying to get Zhi done with crafting/Quo (T5) before Tinkerfest starts. Don't want any distractions! Same here. Since Tinkerfest only lasts a week and there is so much to do on it I would like to focus as much as possible in the event.